Velvet Revolver are far from over, says Slash - this despite the fact that the guitarist is currently promoting his solo album, bassist Duff McKagan has joined Jane's Addiction and the group is still without a lead singer. "I've been doing this record, and there's a tour and Duff's been playing with Jane's Addiction, so everybody has been pretty busy," Slash told MTV News. "But at some point early next year, we're going to reconvene and take a good serious look at everything that we've got." What they've got is some re-assembling to do. The supergroup, comprised of Slash and his fellow Guns N' Roses bandmates Duff McKagan and Matt Sorum, along with guitarist Dave Kushner and Stone Temple Pilots singer Scott Weiland, put out a pair of successful albums. But when Weiland returned to the STP fold and the band found themselves without a frontman, many wrote Velvet Revolver off as dead in the water. Not so, says the top-hatted one. According to Slash, they intend to trudge on - and they've even got an armload of new material. "As soon as we got off the road from the last tour and parted ways with Scott, we got together and wrote half a dozen really great, sort of heavy metal pieces of music," Slash said. "It's a lot heavier than what Velvet Revolver has put out, so I'm dying to put out the quintessential Velvet Revolver record." The guitarist explained that "when Duff and Matt and I first got together, we wrote a ton of material that never saw the light of day, and that was all very heavy. It's definitely our natural way of doing things. But when we started working with Scott, we started to lighten things up a lot, and we progressively got lighter. As much as I love the two records we did do, one of the things that was progressively more and more frustrating was the direction the band took." But as heavy as the new songs may be, the group still needs a frontman. Slash remains convinced that the right singer is still out there. 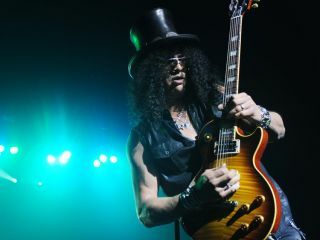 "This next record will be us doing what we want to do without making any concessions to anybody," Slash stated. "Which is why it's taking so long to find a singer, because we want to find the guy who can front that band and not something we have to conform to." Back in 2008, MusicRadar conducted a readers poll, and 46 percent of you said that Axl Rose should join the troubled Velvet Revolver (thereby making the band, in essence, Guns N' Roses). So what do you think? Is Axl still a good choice? Let us know!